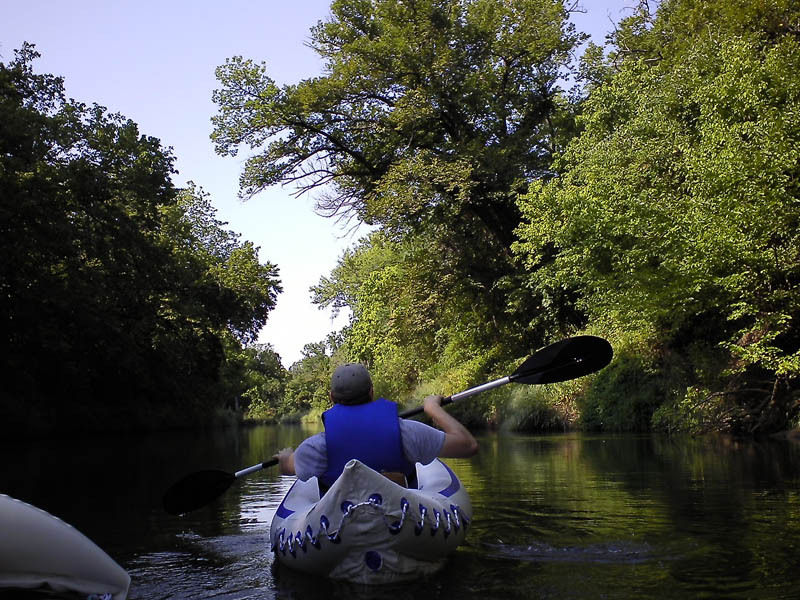 For this trip down the the Trinity River we chose to use Sea Eagle 330 inflatable kayaks. These kayaks were chosen in this case mostly for logistical reason. 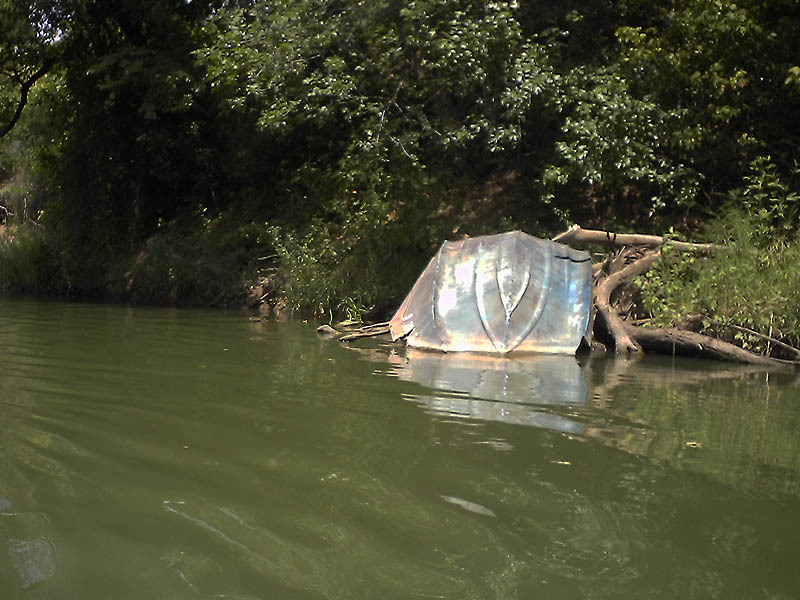 When deflated, the kayaks fold up into a bedroll sized package. At this size they are easily carried, and more importantly, easily transported. No roof racks required. The Sea Eagles unpack and inflate in just 15 to 20 minutes with a manual foot pump. We were in the water 30 minutes after we arrived. 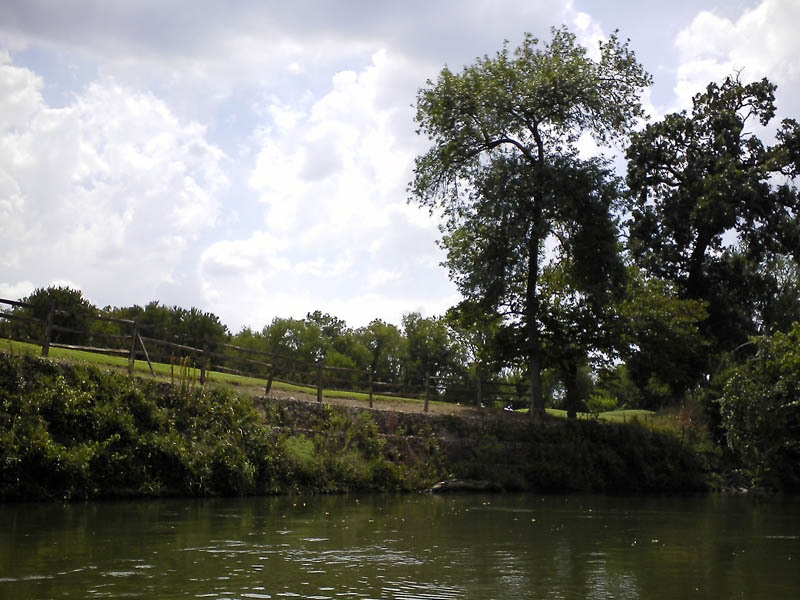 The Elm Fork of the Trinity River was the venue this time out. 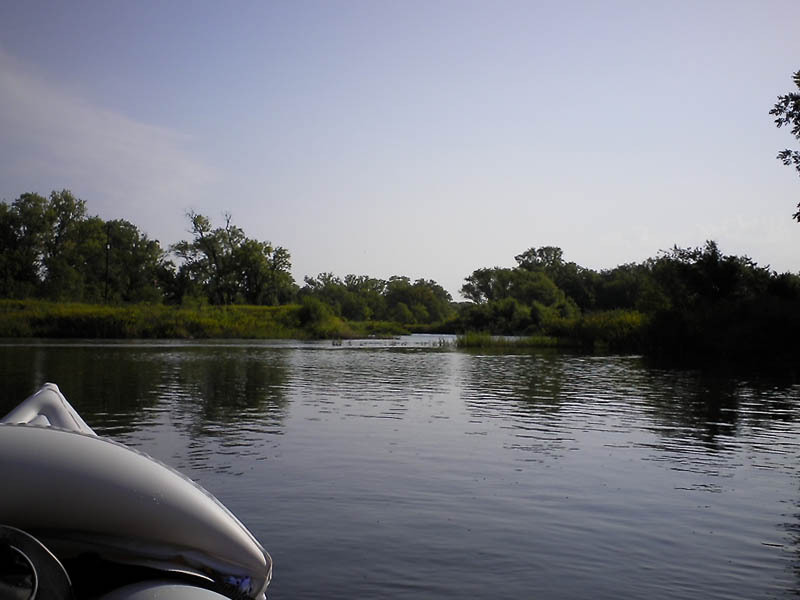 We put in just below the Lewisville Lake spillway with the intention of paddling 12 miles (19.3km) to the Sandy Lake Road takeout. 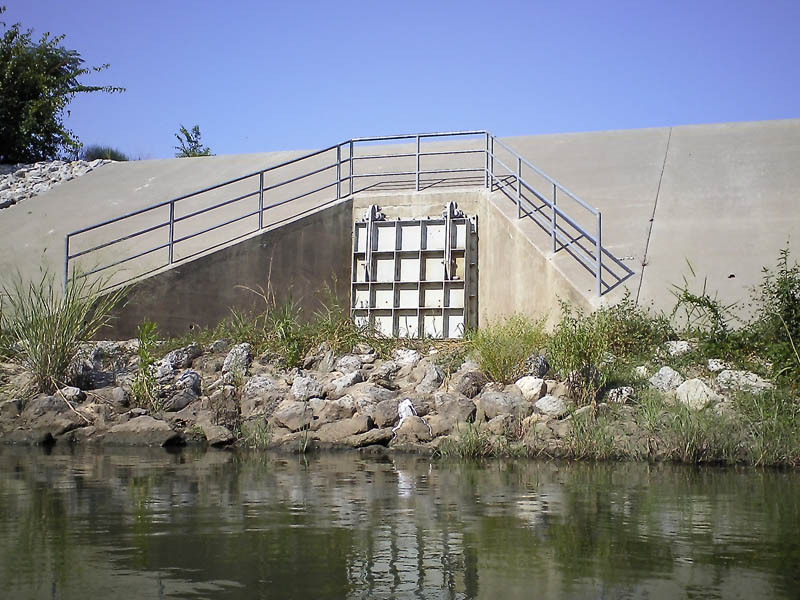 The kayak launch at the Lewisville Lake spillway. 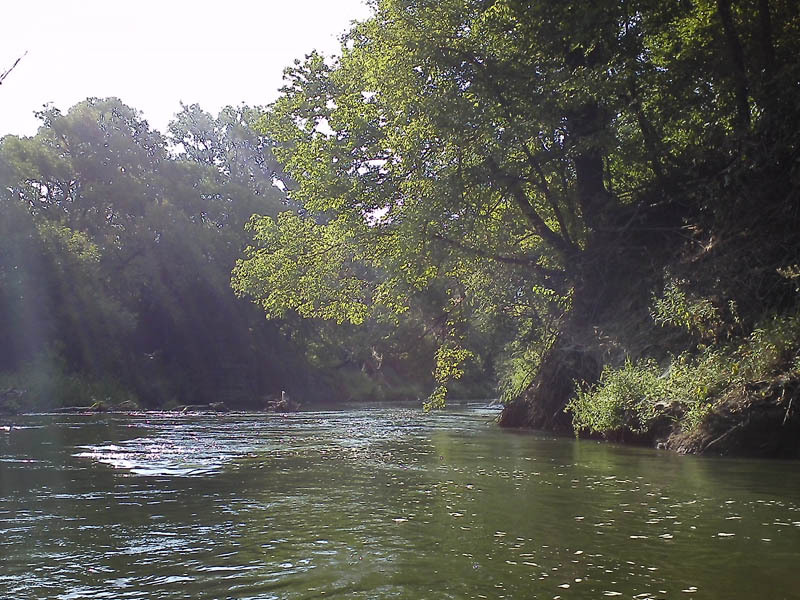 The river is different here than the Trinity I am most familiar with. 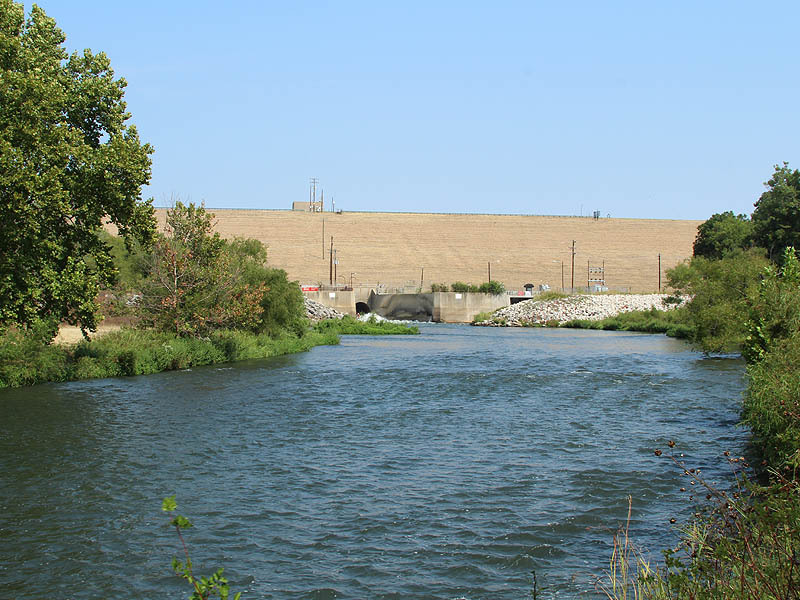 Charged with water flowing out of the spillway, the normally sluggish Trinity River has a strong running current here. 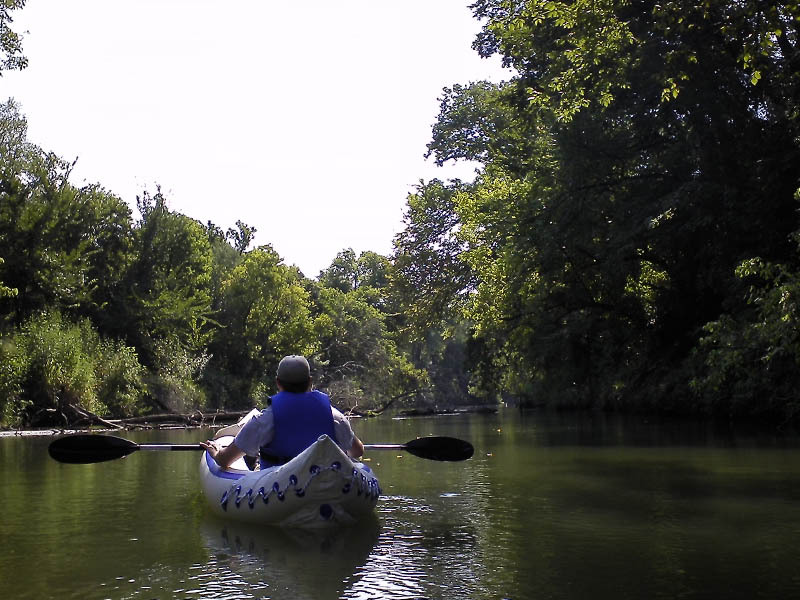 The water flows over a gravel base rather than the typical silty mud, and is surprising shallow—just barely deep enough to float a kayak in some places. We found the fast running water quite helpful. 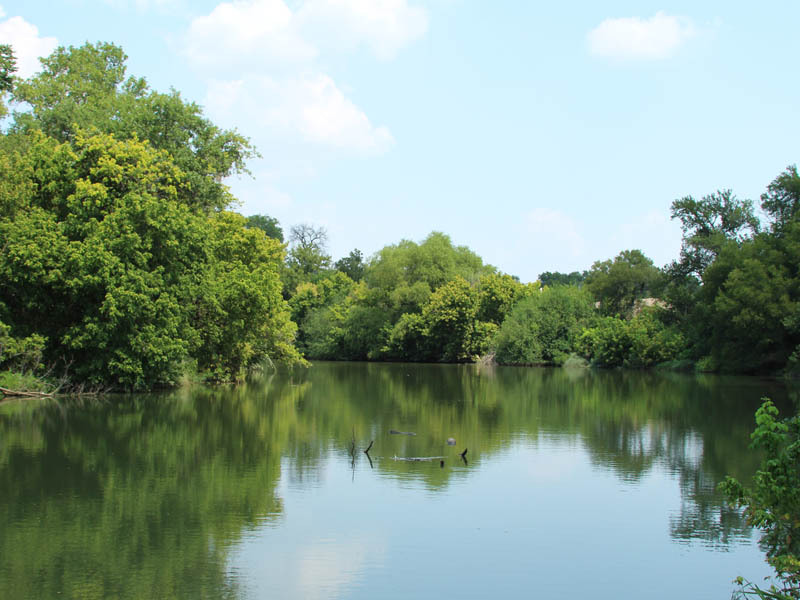 It kept us moving at a good pace with minimal effort—a big plus on what was shaping up to be another hot Texas Summer day. Steadily moving and shallow water over a gravel base. Moving right along, the first landmark we passed was the KCS RR bridge. Close by were the remnants of what was certainly a support structure for an older bridge of a similar nature. 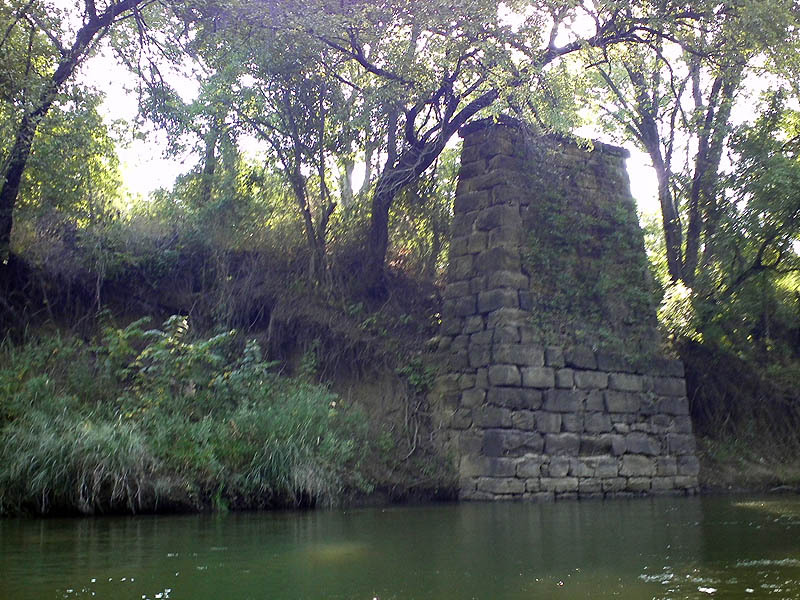 The KCS Rail Road trestle. An artifact of a time gone by. 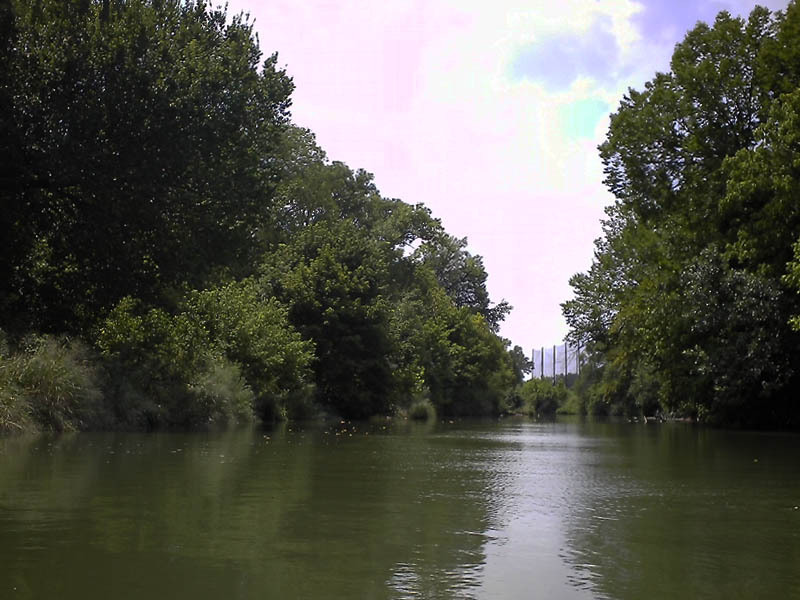 Also near this spot was the mouth of the old Trinity River channel. The entire river was rerouted slightly when the dam was built and a dried slough is all that remains. 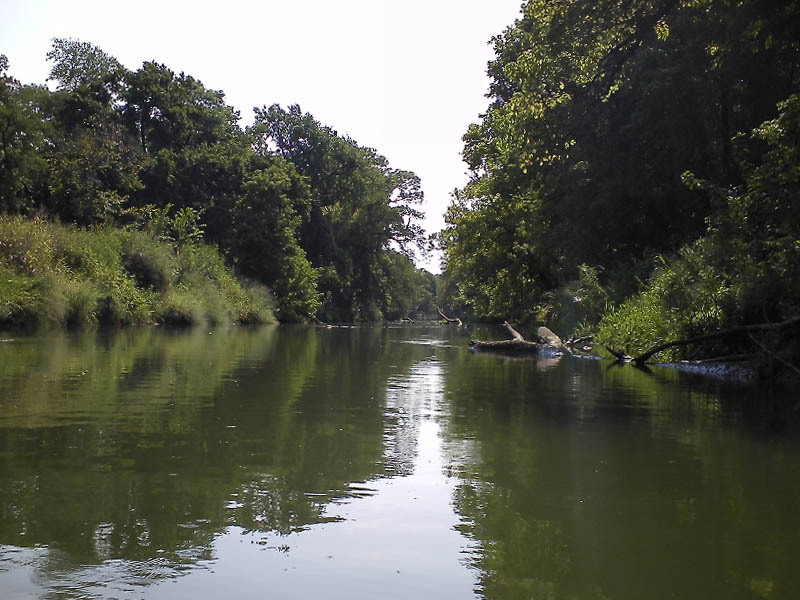 The mouth of the original Trinity River channel. A little further south and we found the mouth of Prairie Creek. 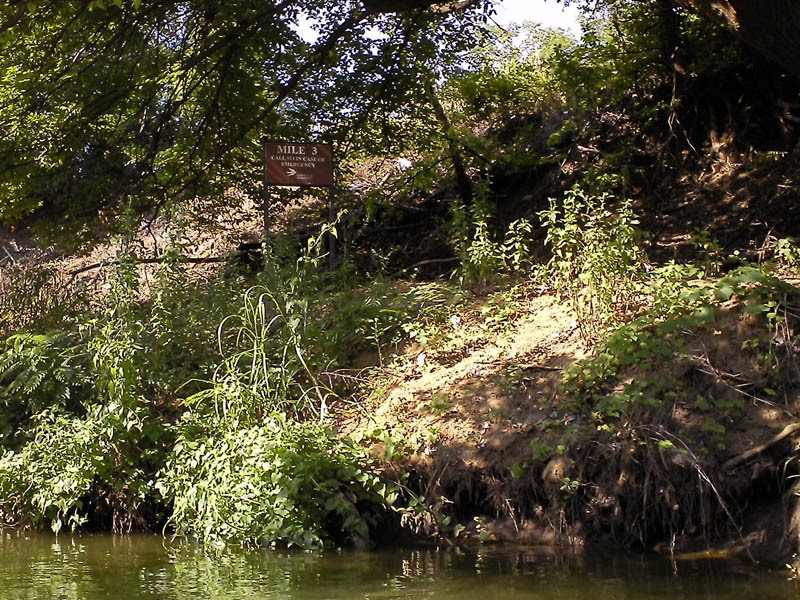 This creek starts several miles to the west and flows across most of the width of the City of Lewisville. This creek is special to me because the woods around Prairie Creek are were I cut my teeth as an outdoorsman when I was a kid. 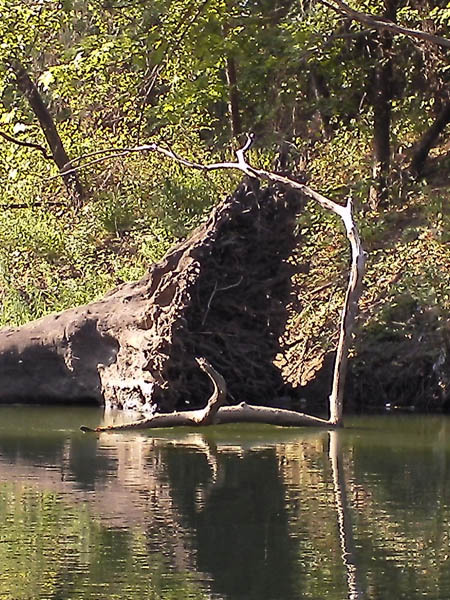 An odd dead-fall with bizarre and elaborate roots. 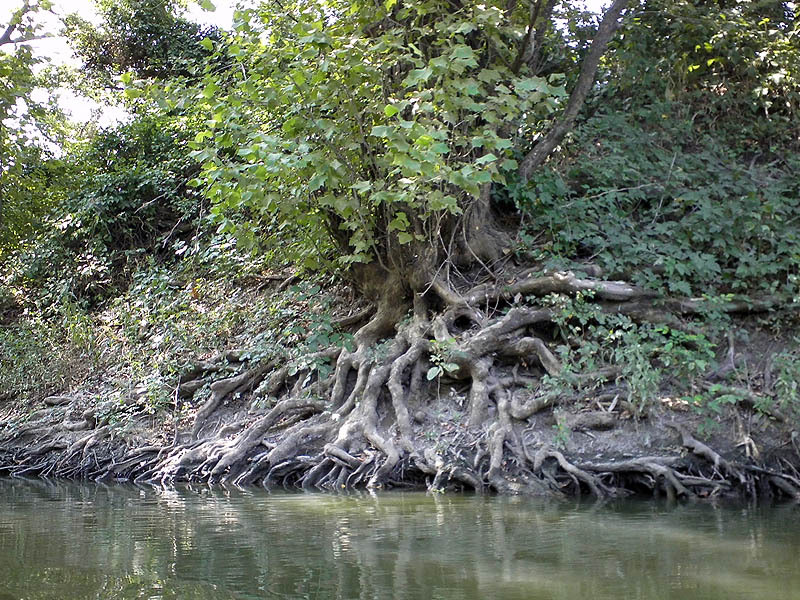 A closer look at the root system. 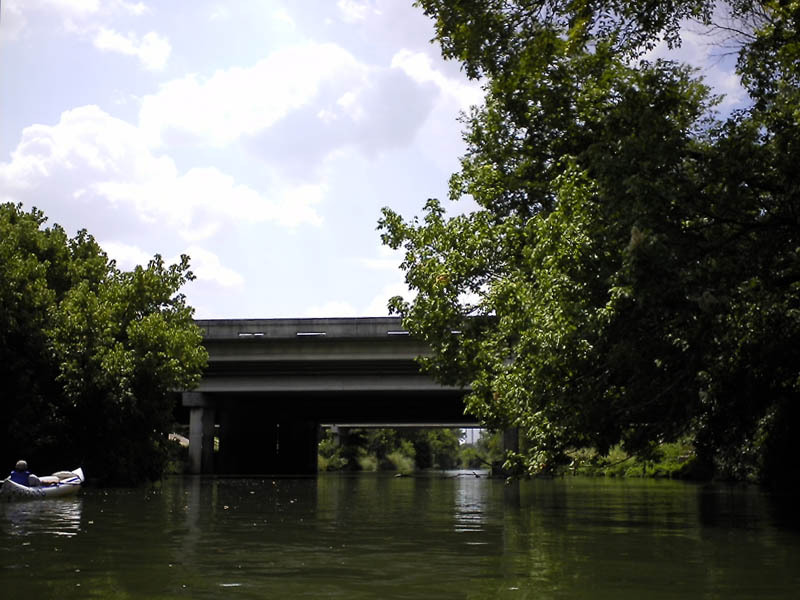 Two miles (4km) downstream and we paddled under the Business 121 bridge. 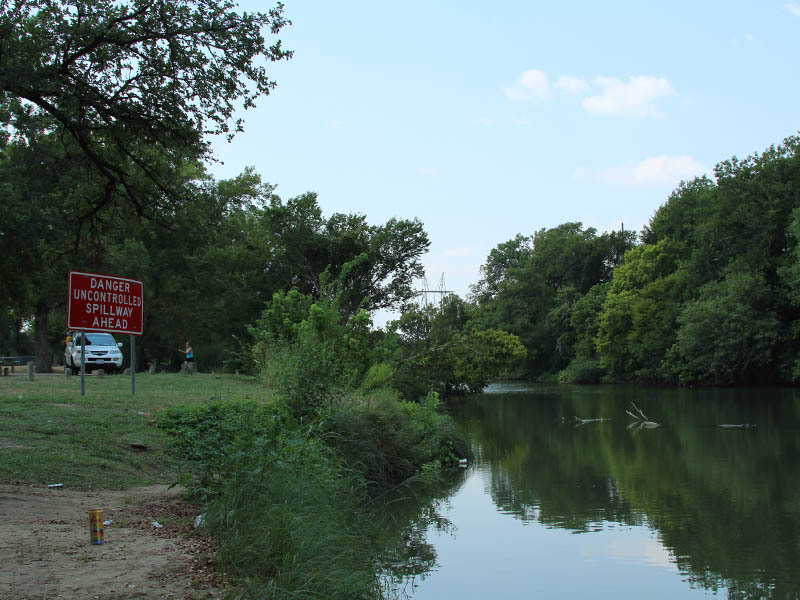 Here we noticed the second of six mile markers that had been place along the banks of the Trinity River for the benefits of canoeist and kayakers like us. Approaching the Business 121 bridge. 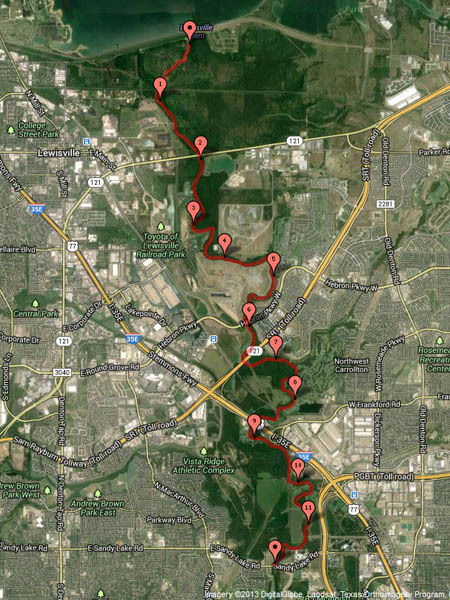 There are a lot of small lakes of various sizes near the Trinity River along this route. 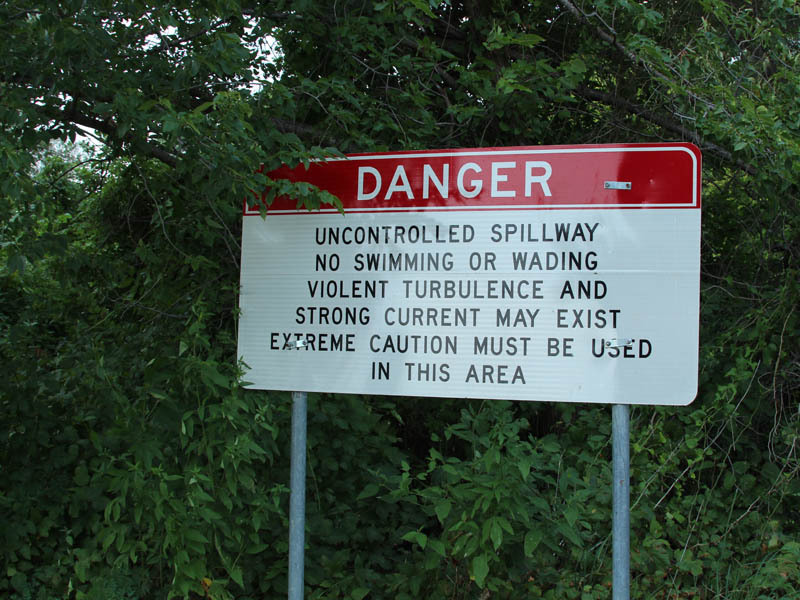 We passed our first spillway shortly after after the 121 bridge. The first of a number of small lake spillways we passed. A little further along and we began hearing the sounds of trucks and other heavy equipment operating in and around the DFW Landfill in Lewisville. 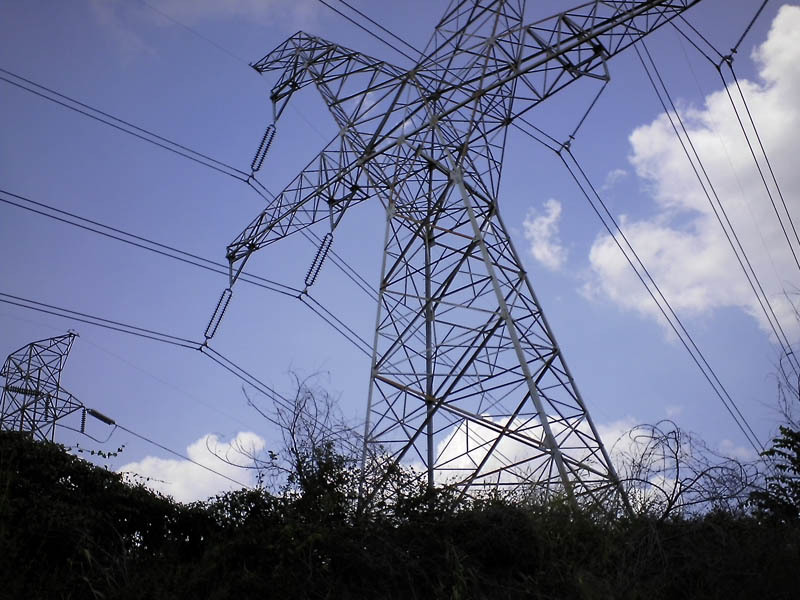 Even though the view from the river often implies a remote wilderness there are almost always reminders–like the grinding of gears and revving of engines emanating from the landfill—that you are still in a major metropolitan area. 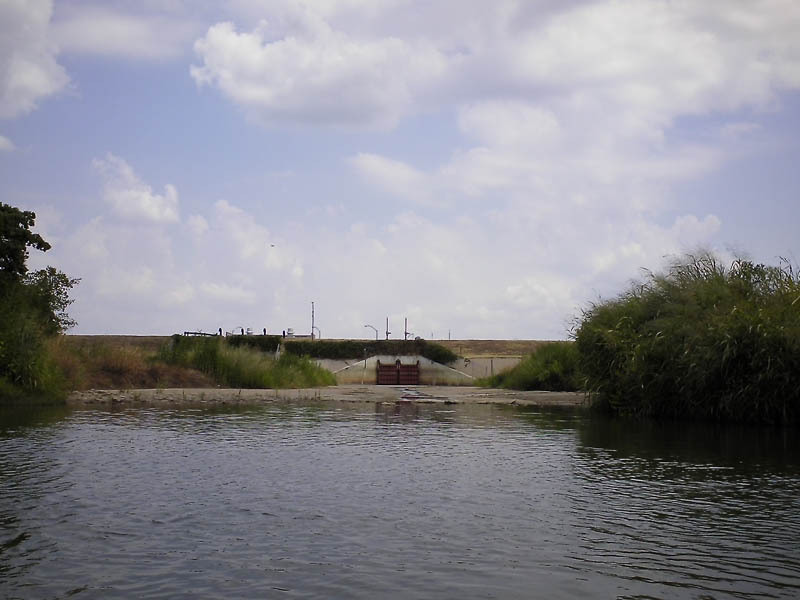 The river runs for quite some distance as it winds itself around the perimeter of the sanitary landfill. On this leg of the journey we passed mile markers 3, 4, and 5. Mile marker 6 is located near the Hebron Parkway bridge in Carrollton. This was the half way point, and our emergency bailout spot. If things were not going well, this is the place where we were going to end the trip early. 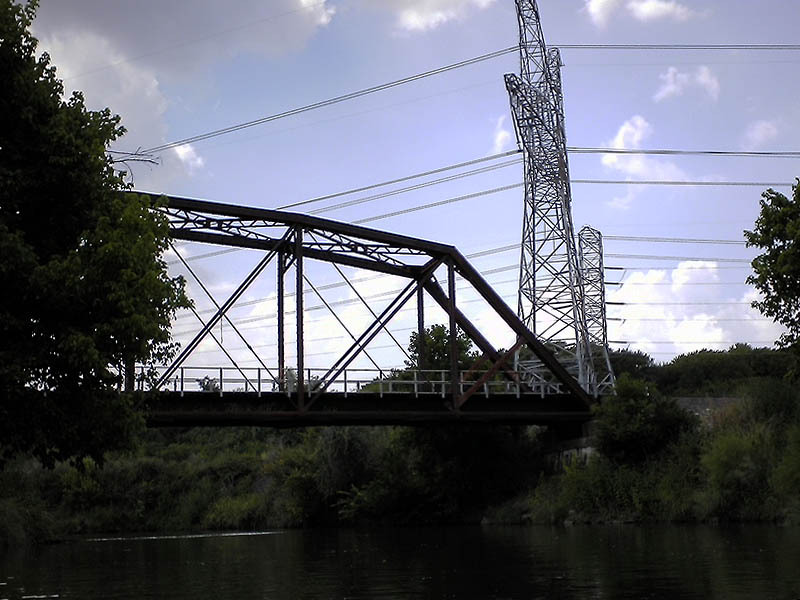 The Hebron Parkway bridge in Carrollton, Texas. Mile Marker 6. The halfway point. Fortunately, things WERE going well and we were still feeling good, so we continued on. Only 6 more miles to go! 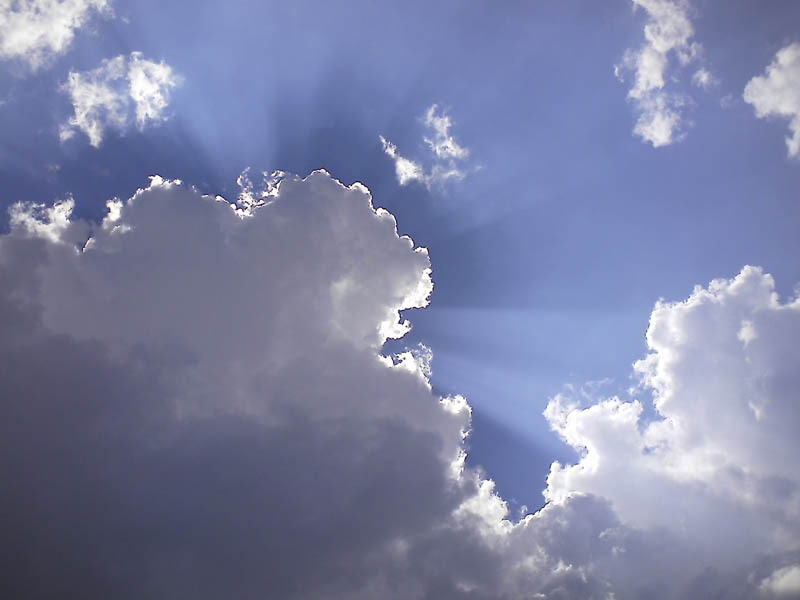 Unfortunately, by this time we had lost the impetus of the current (several miles back actually), and now the sun had climbed high in the sky. 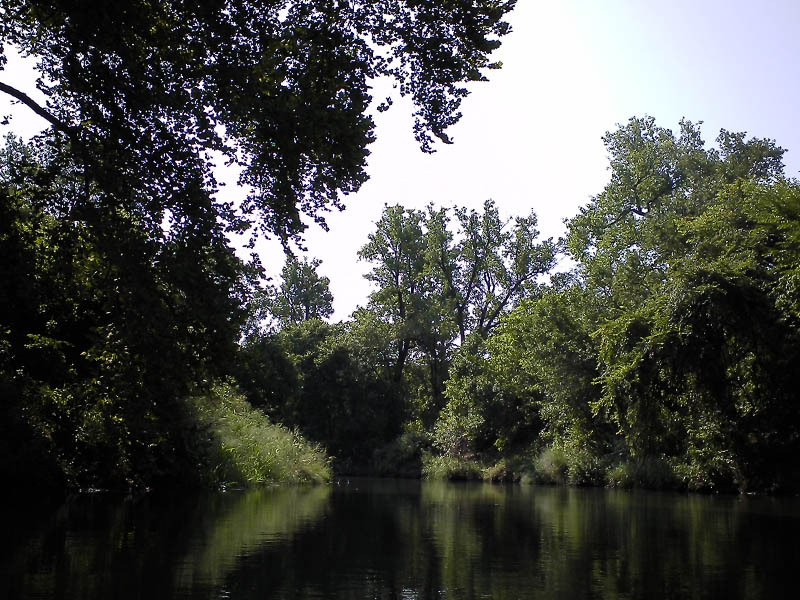 There was very little shade left on the river and it was getting HOT. The next six miles were definitely going to be more difficult that the first six miles. To make matter worse, inflatable kayaks may not have been the best choice for a trip of this length. Their tendency to flex, give, and bow requires extra effort from the paddler to overcome. 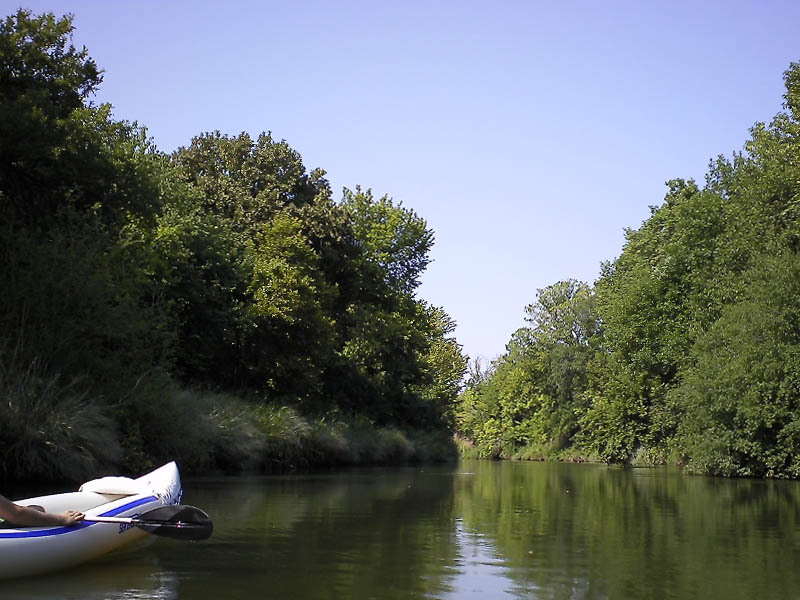 We were at a decided disadvantage to folks in hard-shelled kayaks. 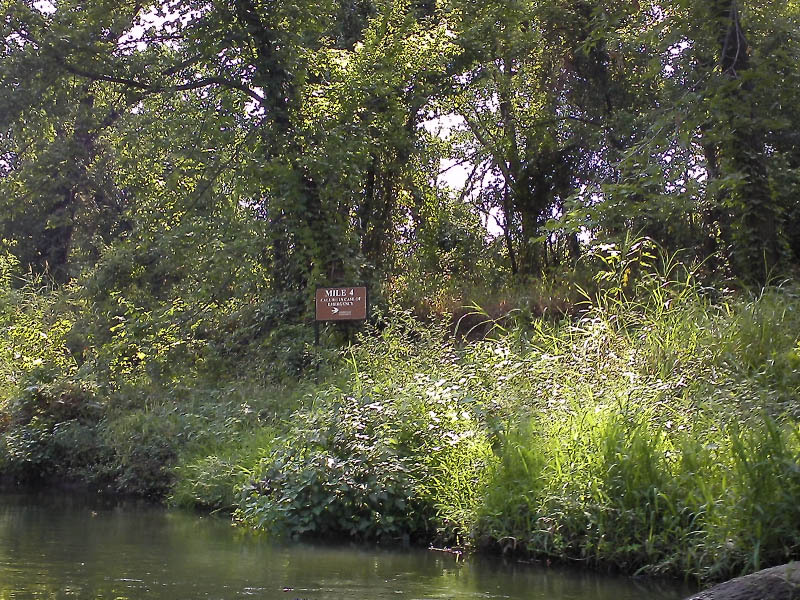 In fact, we were overtaken and passed by a group of three such paddlers during this leg of the way. They burned us! 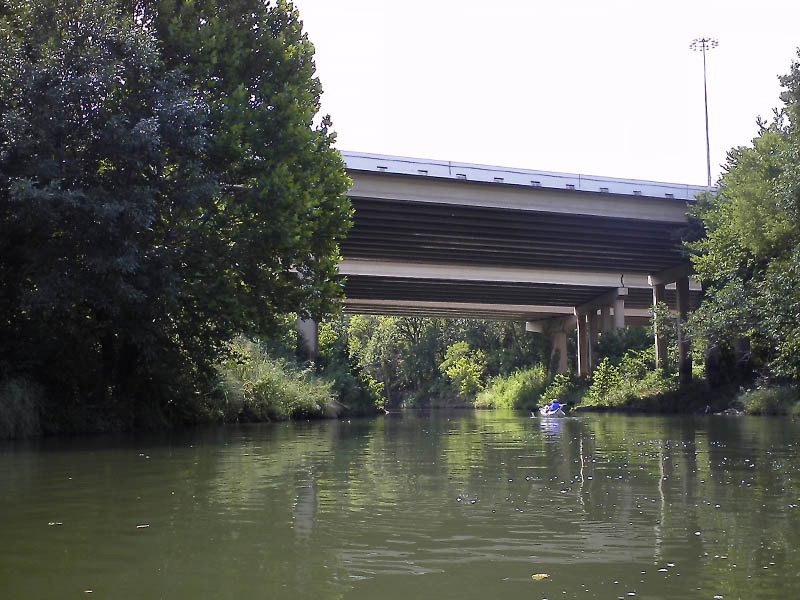 But, we kept going, enjoying the beauty of the river setting as we passed under the gigantic Sam Rayburn Tollway bridge and then traveled along the margins of Indian Creek Golf Course. 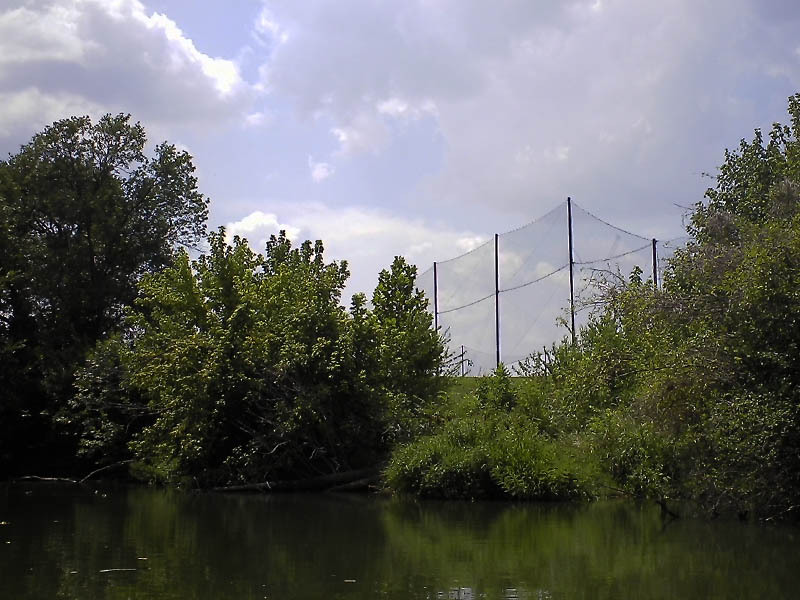 The Indian Creek Golf Course appears in the distance. 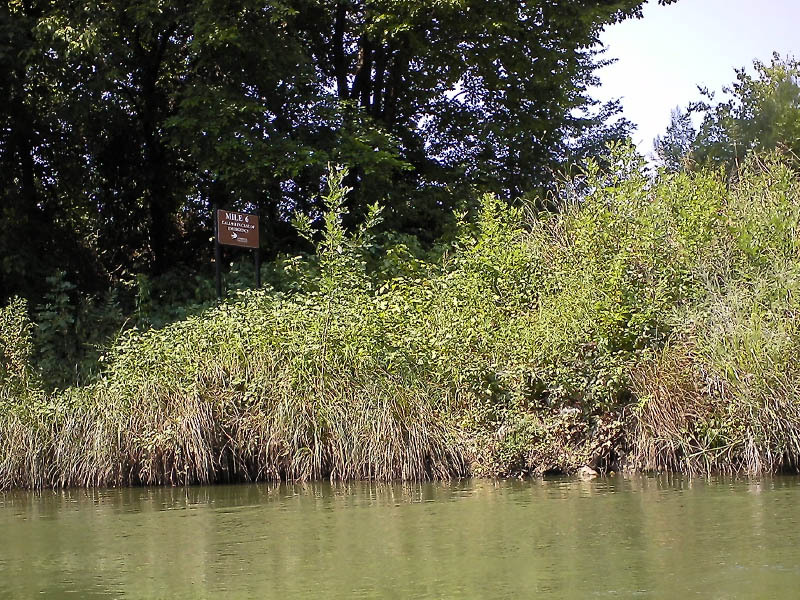 We passed a small island at this juncture of the trip, and followed the river around the golf course facing side. 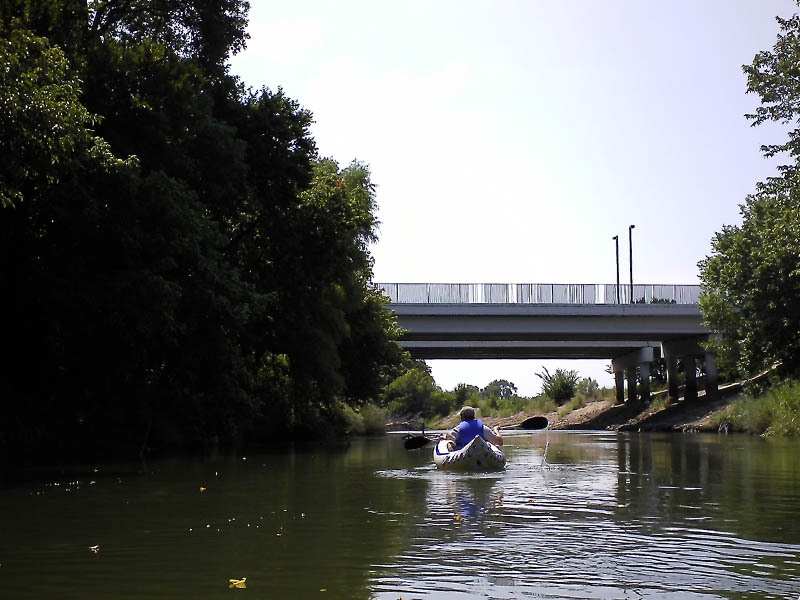 Next, we arrived at the DCTA trestle and then the I-35 bridge—another major milestone. We were approximately 9 miles (14.5km) in at this point. In some places there were imposing signs of civilization. 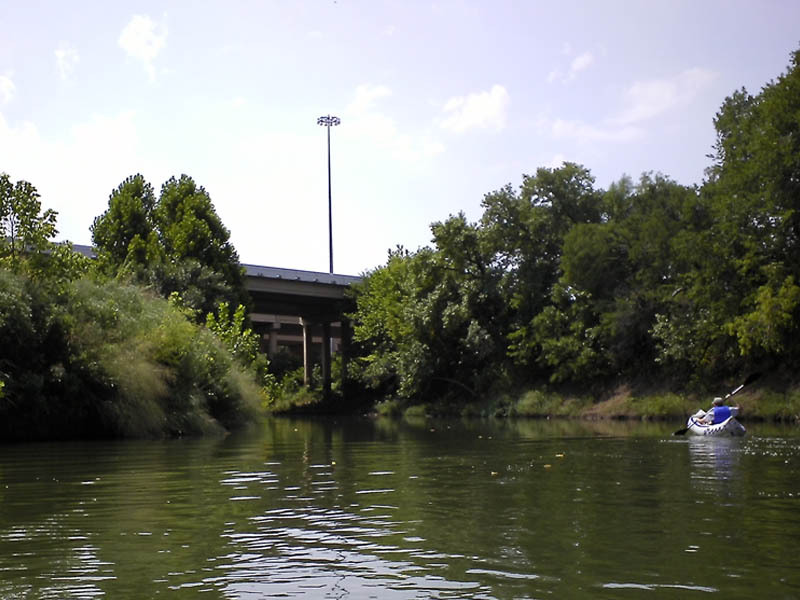 A major milestone—the I-35 bridge. 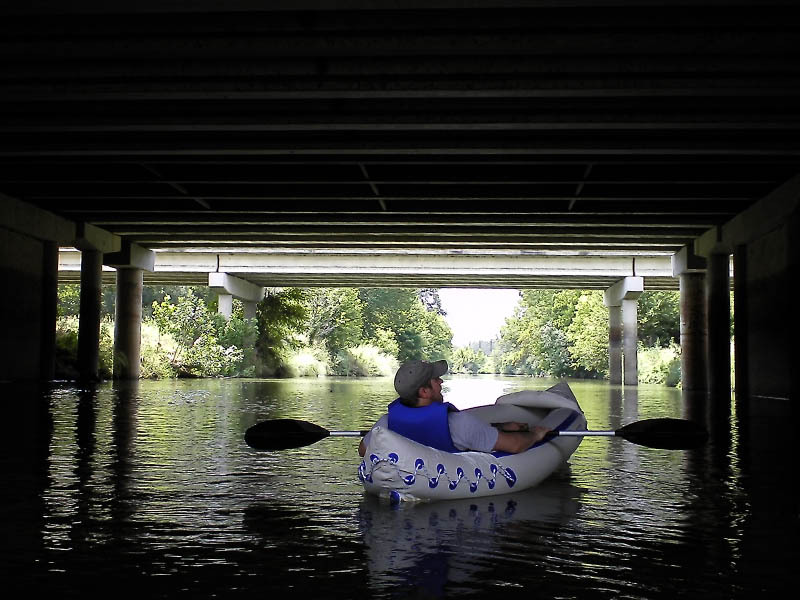 Under the cavernous I-35 bridge. 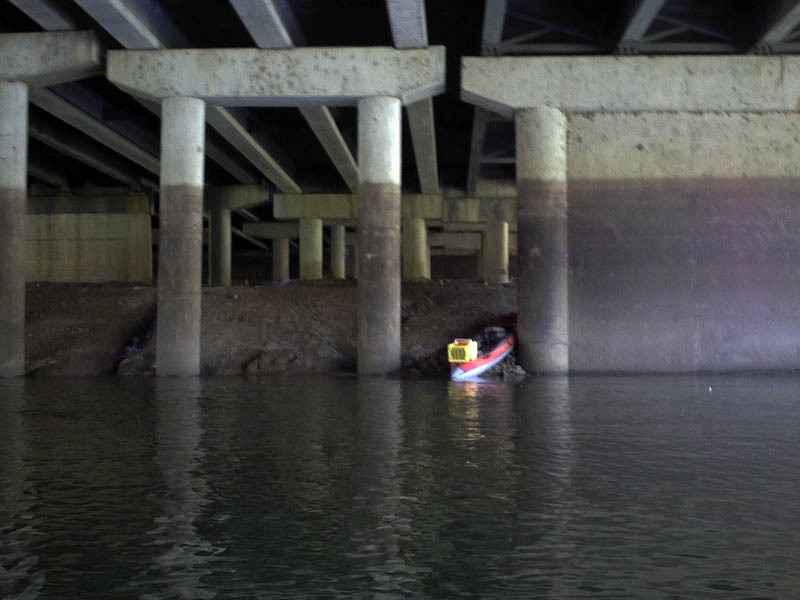 We noticed this kayak parked under the I-35 bridge. We did not see the operator. It was getting close to lunchtime, and we got a little distracted from our river photography. Hank Haney’s Golf School in Lewisville soon came into view in the distance, and we began to hear range fire coming from the Dallas Gun Club to the west. Hank Haney’s Golf School in the distance. Driving range screens at the Hank Haney Golf School. 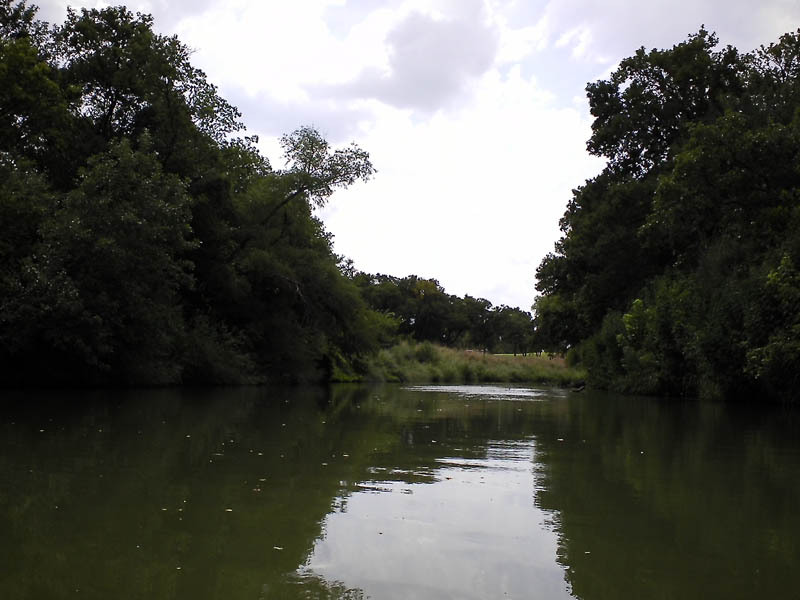 The river along this section was much more typical of the Trinity River I am familiar with. Slow moving,almost still waters. 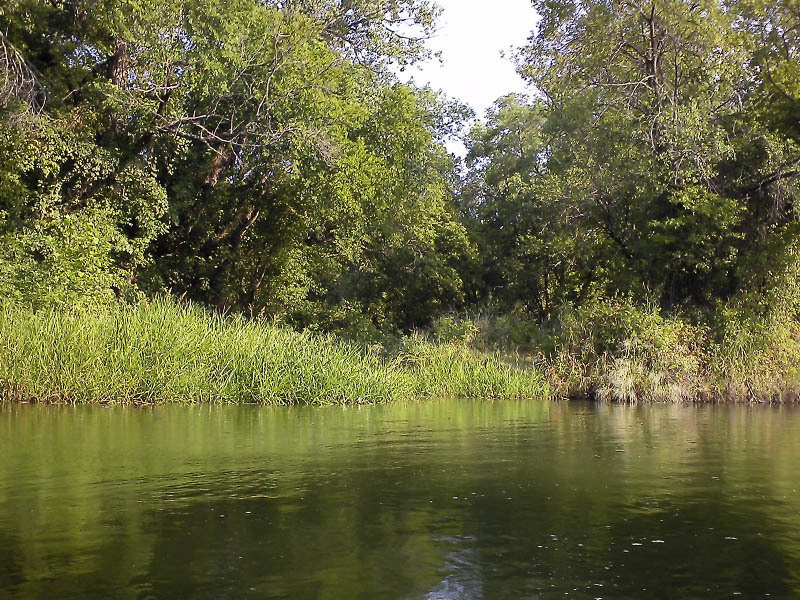 High, steep banks topped with lush bottomland forest. 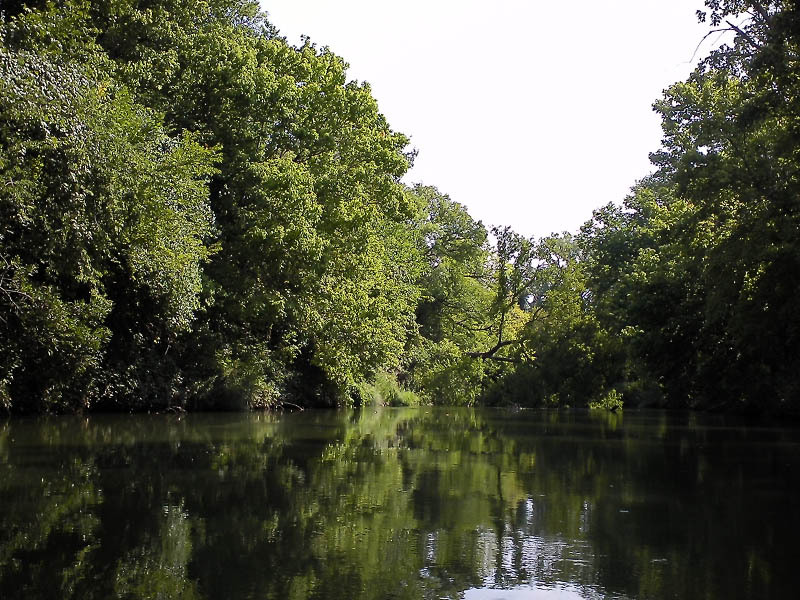 The Trinity is a powerful river and at times unsettling. 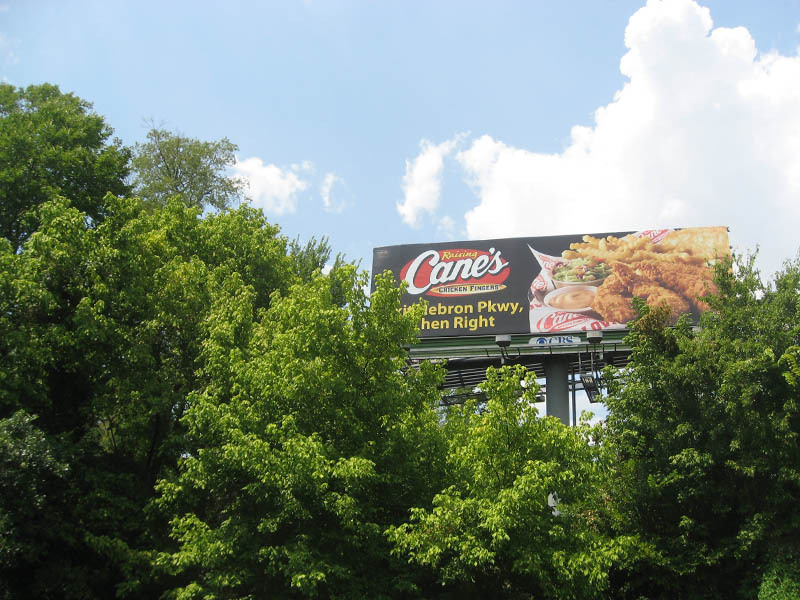 Your subconscious picks up on the strange juxtaposition of wilderness on top of the urban, and leaves you with a vague sense that something is not quite right. Sometimes you will be swept with a sense of forboding as if you are partaking of something forbidden. But these feelings only come when you let them, and they are fleeting. 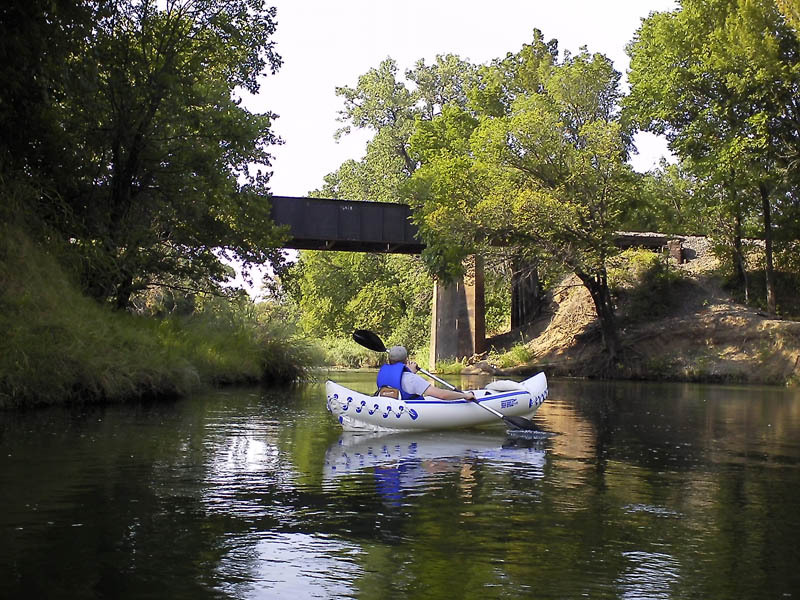 Its part of what makes exploring the river exciting and fun. 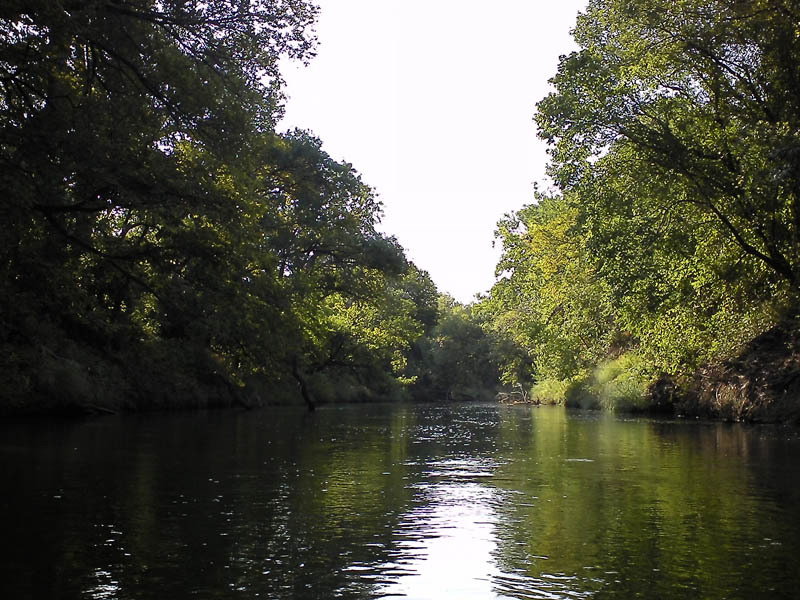 A remote stretch of the river. An odd iron pipe jutting out of the river near the middle of nowhere. 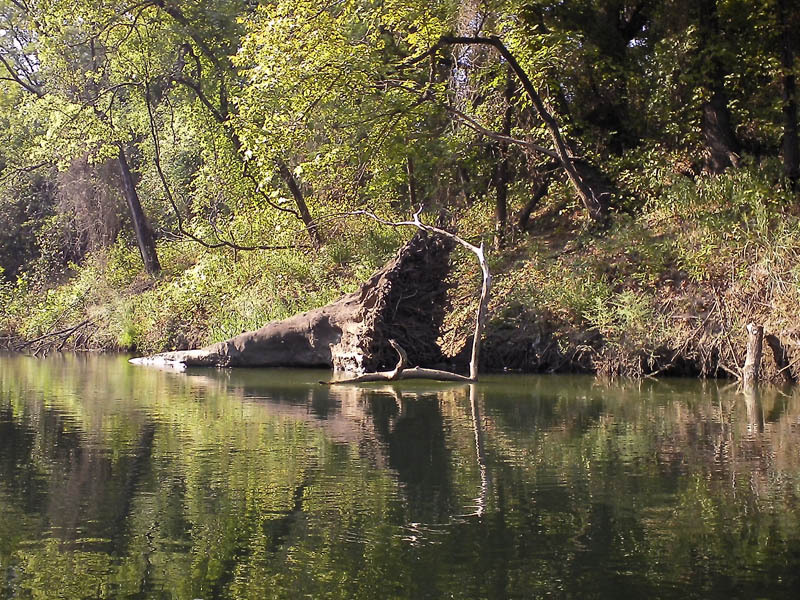 A small boat deposited on a snag courtesy of the Elm Fork. The blazing sun, however, was not fun, and when the opportunity presented itself we would stop for a moment in the shade of an overhanging tree to cool off a bit. Sometimes an uninvited passenger would attempt to board during these respites. 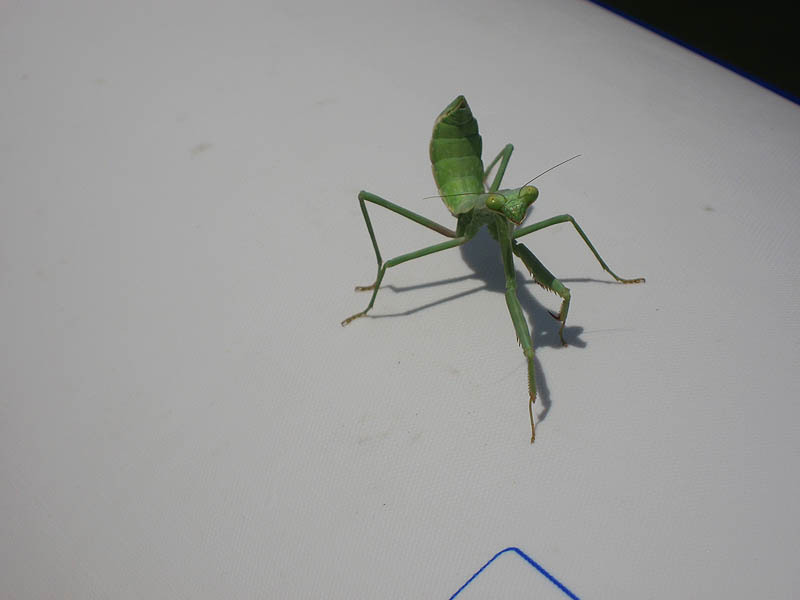 A Carolina Mantis joined us for about a quarter of a mile before jumping off again. A little later a harmless Rough Green Snake tried to stowaway, but was a bit too slow. At this point of the journey the relentless sun began to add some urgency to our efforts. We were rapidly approaching the need for some relief from the heat. 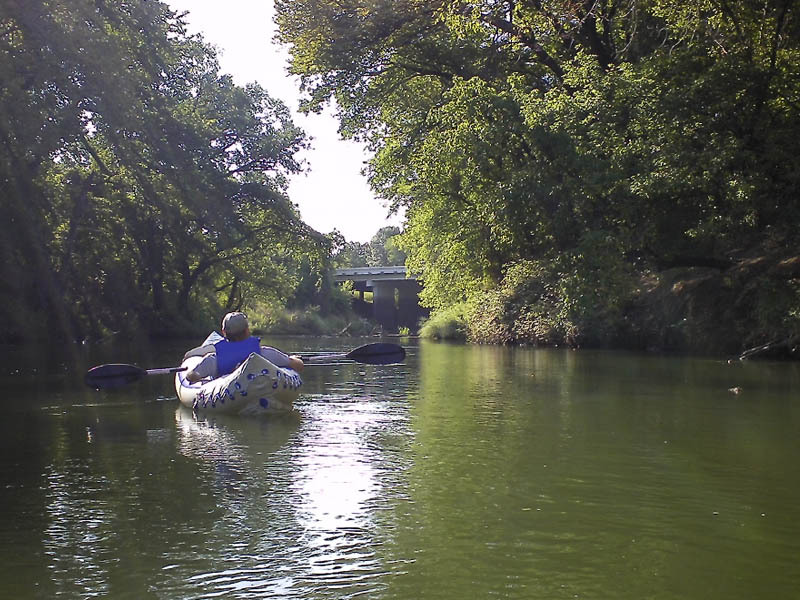 So, we knuckled down and searched for rhythm in our paddling—a zen state that would allow us to keep our kayaks moving. When we finally found it—when we got into a groove—we pushed along at what was perhaps our best pace of the entire trip. So focused were we that at mile 11 we neglected to stop and take a photograph of the imposing Carrollton Treated Waste Water River Return. Our objective for the day was within reach now, and we were set on reaching it! 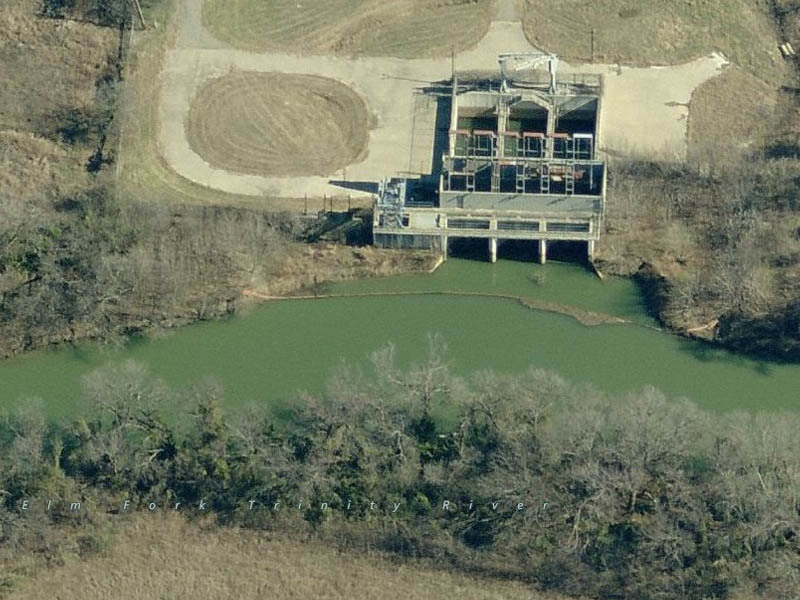 Carrollton Treated Waste Water Release. Picture courtesy Bing.com Maps. We rounded a bend in the river and the Sandy Lake Road take out came into view. We had almost made it, but this spot was not without a few dangers of its own. The placid waters near the Sandy Lake Road take out. Carrollton Dam, with its treacherous spillway is just past the deceptively peaceful waters at the Sandy Lake Road takeout. Rumor has it that over the years several brave (foolish) paddlers have attempted to run the dam—all with disastrous results. The Sandy Lake Road take out area is deceptively peaceful and beautiful. Caution must be exercised here. 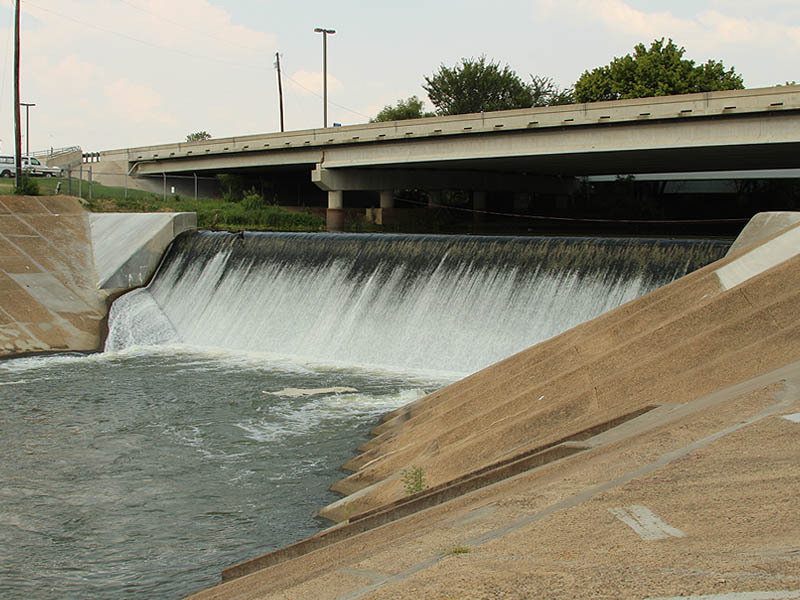 Carrollton Dam. Notice the rope strung across the width of the river to give people one last chance to avoid going over the falls. Of course, something like that was not in the cards for us on this day. 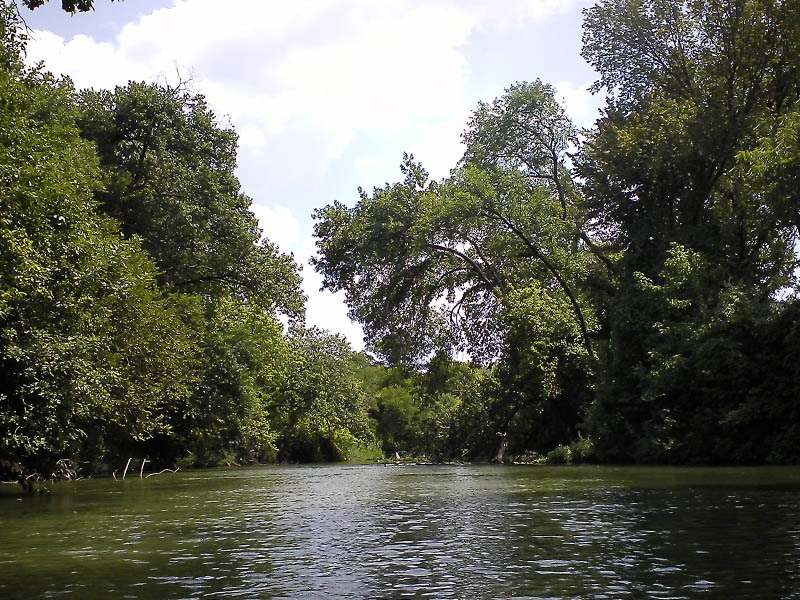 We took out our kayaks without incident, packed up our gear, and then headed back to Lewisville to retrieve our other car. Next, it was off to Starbucks for an iced coffee (maybe not the best choice) to kick off the recovery process. Sore muscles and overworked shoulders plagued us well in to the middle of the week! Unquestionably worth it! Chris, looks like a great trip!! 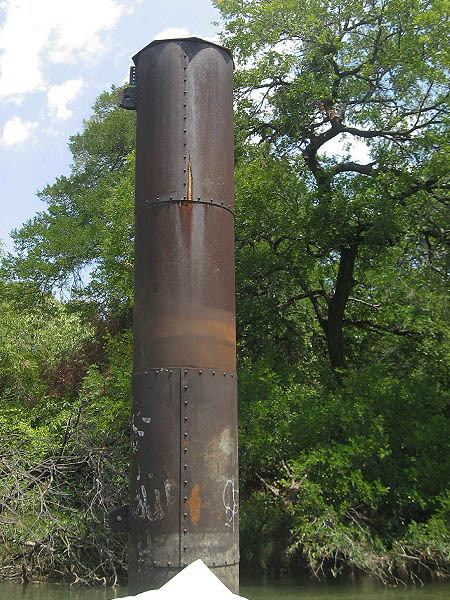 I believe that the “odd iron pipe” once contained an early USGS flow gauge. It was a great trip! 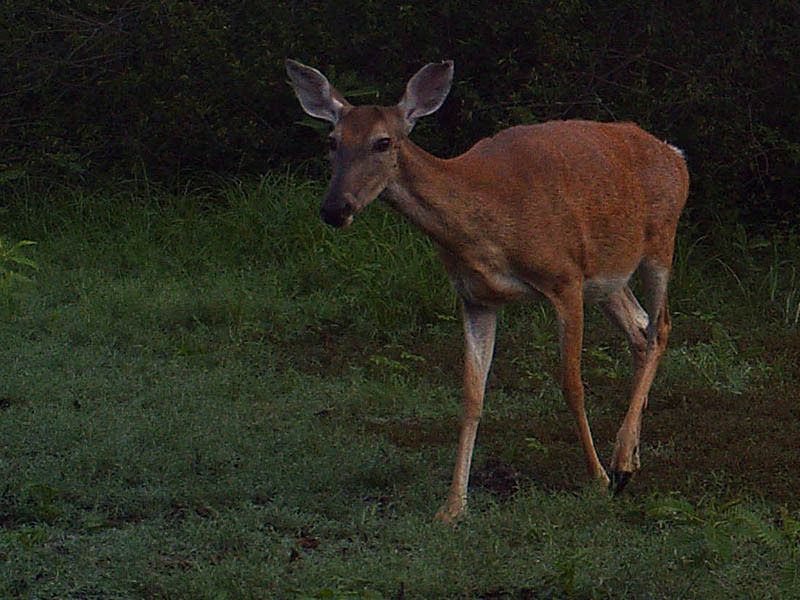 Didn’t see as much wildlife as I had hoped, but we got off to kind of a late start. The animals probably had enough sense to get out of the hot sun! What can you tell us about how the USGS flow gauge functioned? 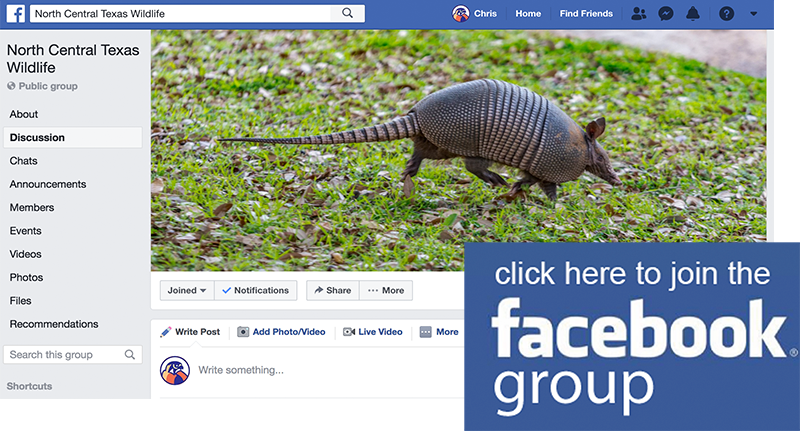 There are other links on those pages that give more information.